Medium (7-8) - $33.99 Only 8 left! Is your kiddo ready to be the most feared pirate in all of Neverland? Does he dream of taking down that blasted Pan and the Lost Boys? Is he a little more frightful when it comes to crocodiles than most other children? Does he hate the sound of clocks? Well, we have the perfect costume for him then. 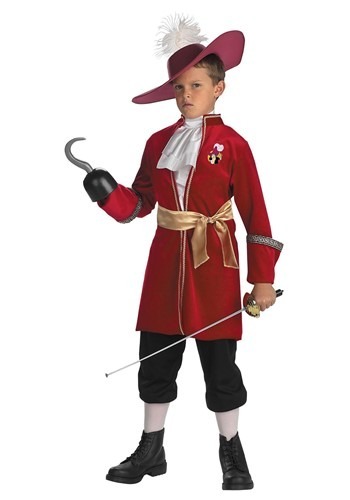 Check out this amazing Child Captain Hook Costume! This flashy costume will make your little one look like the infamous villain in the tales of Peter Pan and the magical land of Neverland. The devilish maroon jacket has a lovely gold trimming at the front and the collar edges, brocade ribbon at the sleeve cuffs, as well as a patch of Hook from the animated Disney film on the left side. The golden sash is also attached to the jacket so no worries of losing it while upon the high seas. Once your kiddo tosses on the black pants his transformation will be just about complete, he just needs to accessorize now! One accessory that is included is the white tricot dickey that can easily be fastened around your little one’s neck. Take a look through the rest of our pirate themed accessories to find him a classic pirate hook, as well as a trusty cutlass, and a fancy feathered hat just like Hook’s. Before you know it, your little one will be off to Neverland to finally settle a score with that wretched Pan. Hopefully, before he sails off on that adventure, he has plenty of fun running around town this Halloween. Who knows, maybe enough sweet treats will help him forget about his grudge with Peter!